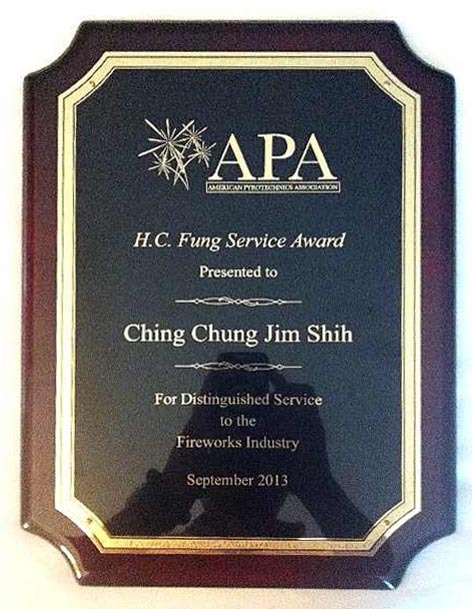 September 2013 -On behalf of the APA Fireworks Association in the US, selected by the executive committee in honor of the late Fung Hon Chu (past chairman of the Board of the Li & Fung Company, in Hong Kong) presented the H.C. Fung Service award (Lifetime Achievement) to Mr. Jim Shih as a reflection of distinguished service to the fireworks industry. 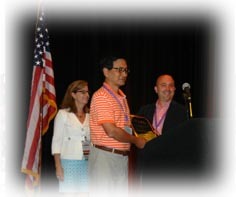 The HC Fung Service Award was presented or the first time at APA’s 50th Anniversary convention in 1998. It is named in honor of the late Fung Hon Chu, past Chairman of the Board of the Li & Fung Company, in Hong Kong. The award is known as a lifetime achievement award, presented when deemed appropriate by the APA to a person as a reflection of distinguished service to the fireworks industry. 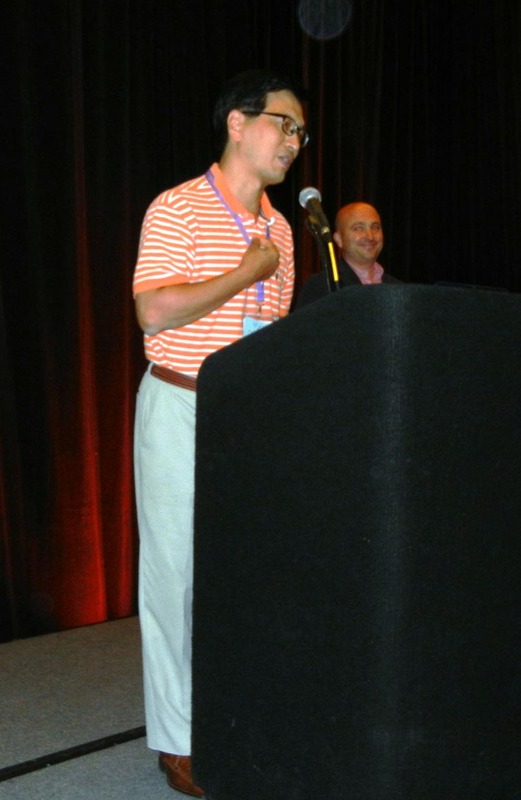 The recipient is selected by APA’s Executive Committee. Past recipients include Sam Lau & Oki Okuyama, Chi-Kay Chung, Francis Wu, Li & Fung, and Tom Chan. 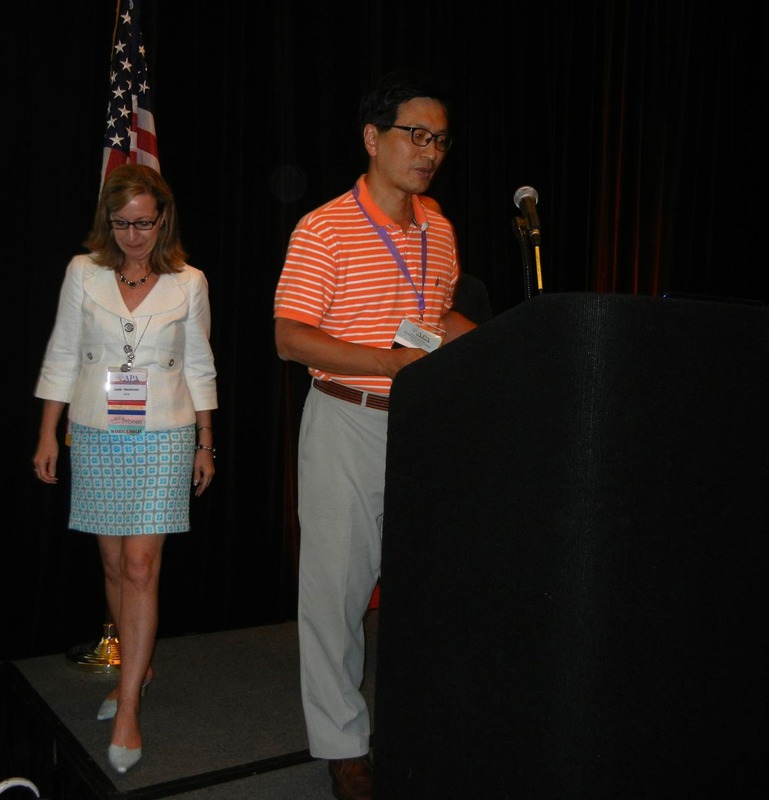 The APA has not presented the award since our last honoree, received the award in 2008. However, the APA Executive Committee felt strongly about presenting the award to a well deserving and distinguished Service member today. Over 20 years ago, a young man born in Taiwan, and his father, made the rash judgment that they could build ultra high quality pyrotechnics for a better price and compete with the European and Japanese shell builders �C and do it in Hunan, China. This concept, back then, was brash and some thought terminally na?ve. Not only was this venture successful, but it singlehandedly changed the manufacturing paradigm in the Chinese Professional Fireworks industry. It became quite common in Liuyang to hear, “it’s just as good as Sunny” or “we stole some Sunny employees, so our products are better”. If this wasn’t enough, in the 1990’s they opened an office in the United States, within arms reach of the U.S. tort system! Some saw this move as the pinnacle of naiveté, but that Washington, DC area office is still cranking today, offering outstanding world-wide service. In the wild west environment of China manufacturing and exporting, this well-seasoned professional manufacturer and professional, has maintained a truthful and dependable position in the face of enormous changes not only in our industry, but China overall. The professional integrity, honesty and service is the hallmark of our recipient today, his family and his company. What many may not know about today’s recipient, are some of his personal achievements.? He has received over 30 awards for his choreography and precise synchronization of fireworks displays.? These awards encompass the world, including Montreal & Ottawa, Canada, Beijing & Shanghai, Korea, France, Belgium, and Portugal to name a few. Our recipient is also a world class photographer, avid golfer and tennis player.? And some even say he is a wonderful karaoke singer --- for which I will deny any first-hand information! Finally, our recipient is dedicated supporter of the APA and has always stepped up to support the APA, including significant product donations to enhance APA convention displays, most recently in San Francisco, Seattle and Louisville.? 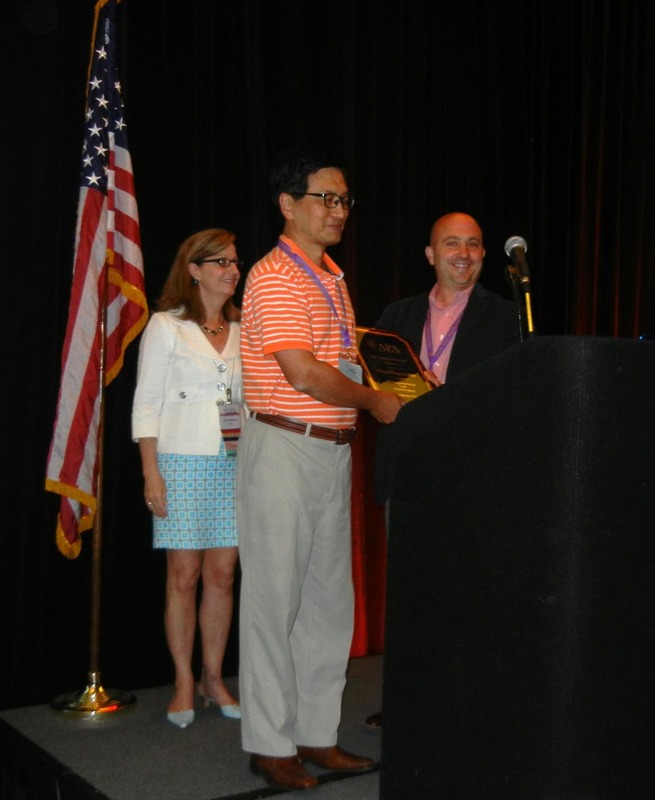 Today, it my honor to present the H.C. Fung Service Award to Mr. Jim Shih, Sunny International.